Tackling the daily habits we have by making them low waste can have a huge impact on our environmental impact. Drinking tea is a common habit a lot of us share; with 165 million cups of tea being drunk every day in the UK, our habit comes with a lot of waste! The good news is, the daily waste is easily avoided with a couple of simple shifts. 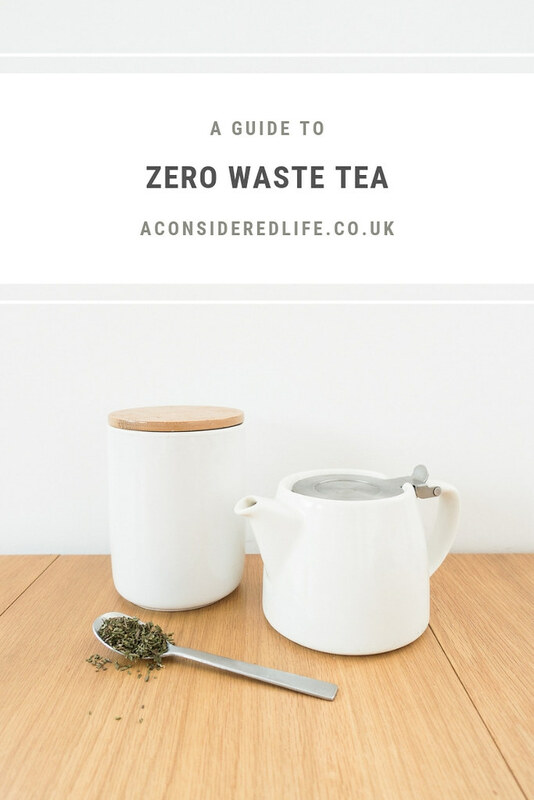 Whether you buy your tea in bulk, grow it yourself, or buy it packaged in eco-friendly packaging, here is a zero waste guide to drinking tea. Making the switch to loose leaf tea is better for the environment and your enjoyment. Tea bags often contain plastic and the majority of them are not biodegradable. Loose leaf tea is better quality and tastes fresher than packaged tea, it's easier to create the perfect cup too because you can control how strong or weak the brew is. 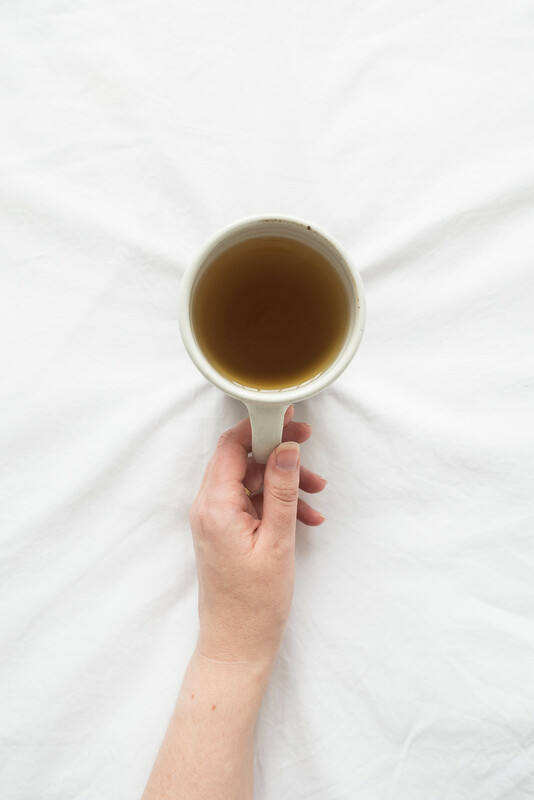 If you use tea, like I do, to remedy mild health issues like stomach aches and sleepless nights, you can create your own tea blends to match your mood or ailment. This works especially well with green and herbal teas. I pick my tea up from my local bulk buy store, the options are limited but it means I can bypass all packaging. Whittard has filled a glass jar I brought into store before although not without a fuss! They prefer you to purchase and use the tea caddies they sell. Look out for independent tea specialists, I've found them to be far more accommodating if you bring your own jar to fill. If you can't find loose leaf tea packaging-free near you, purchase a the largest tin or pouch you can and keep it somewhere cool and dark to preserve its potency and flavour. If stored correctly, loose leaf tea can last up to a year. Tea Pigs have a range of loose leaf pouches, Bird & Blend Tea Co. have tins and pouches as do T2. Store your loose leaf tea in a glass jar, caddy, or airtight container and keep in a cool dark place like a kitchen cupboard or pantry. This will help preserve the tea's potency and flavour, avoiding your tea from going off before you've had a chance to enjoy it. I store my black tea in a ceramic pot with an airtight lid, any herbal teas are stored in reused paper bags kept in an old tin. You don't need anything fancy; look out for suitable jars and pots in secondhand shops or repurpose containers you already own. So long as your container is airtight and either opaque, if it's sitting on a counter, or glass and kept out of sunlight, your tea will last all year - if you don't drink it before then, of course! 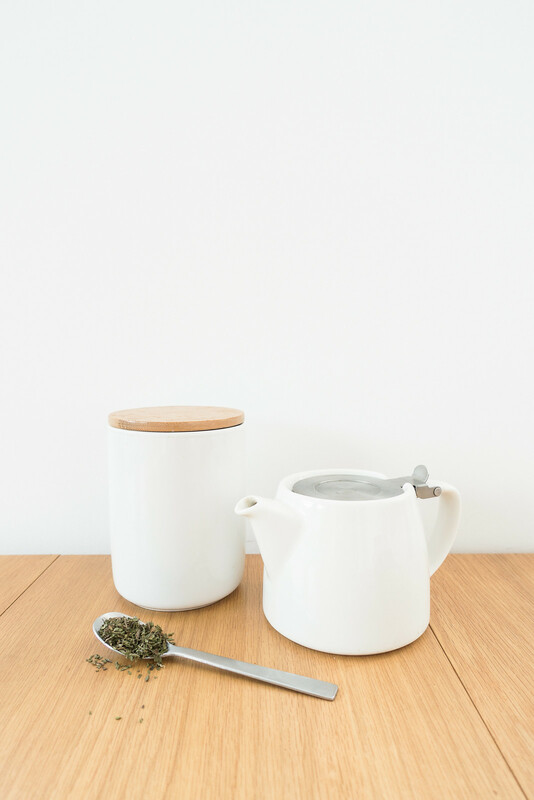 If you can't find bulk loose leaf tea to top up your tea jar and need to resort to buying from the local supermarket or online, look out for the most eco-friendly packaging options. Unfortunately, most tea is wrapped in some form of plastic or non-recyclable packaging. Buying a large bag of tea instead of lots of little pouches will reduce the packaging you bring home. Opting for tins of tea is better than the pouch variety; although they may contain a little plastic wrap, the tin is reusable unlike insulated pouches, which cannot be recycled and have to be sent to landfill. Be especially careful of purchasing tea bags and avoid it if you can, the manufacturing process often requires heat sealing and that process contains plastic making the tea bags non-biodegradable. Tea Pigs have a range of eco-friendly tea bags packaged using sustainably sourced cardboard and printed using vegetable based inks, they even have a guide on how to recycle them. The tea bags themselves do not contain plastic and are completely biodegradable. So if you are keen to stick with tea bags, Tea Pigs are your best option. Fresh mint tea is delicious. A mint plant happily grows in a bright kitchen window; pruning it regularly will create a bushy plant that's perfect for snipping off leaves for a cup of fresh tea. This is a good option for those who don't drink too much tea as a small plant won't yield a great many leaves. Alternatively pick up a bunches of fresh cut herbs and brew them up. The best way I've found to store fresh herbs so they last for as long as possible is to soak and wring a clean tea towel then wrap your herbs up and store in the refrigerator. When they're starting to near the end of their life, dry them out and store the same way as loose leaf tea. Brewing loose leaf tea can seem extra but it's as simple or complicated as you want to make it. You have three main options: an infuser teapot, an infuser cup, or a strainer. Strainers are simple and easy to use with less mess to clean up afterwards. Fill the little metal container with tea and steep in hot water. The only issue with this method, especially with the ball type strainers, is the leaves don't have much room to move around and so the brew you get isn't always the best. I prefer an infuser teapot and have the For Life Stump Teapot, which makes enough tea for two. There are larger infuser teapots available or if you want something smaller, just for you, an infuser cup might be the answer. Don't throw your tea leaves out! Most leaves can be reused for another brew and then be thrown on the compost heap. There are very few low waste options when it comes to milk other than avoiding it completely or making your own. If you take milk in your tea, making your own is probably the best option plus it swerves the issue of tetra packs and any extra waste caused by tea brewing. Each non-dairy milk has a unique flavour; I prefer homemade oat milk in my black tea although I'll happily drink it without. Oat milk is the most nutritious and sustainable milk available but if you're not keen on the taste, try a few to see which you prefer. If you like grabbing a cup of tea to take away, investing in a reusable cup is essential. Even though a lot of places are switching to biodegradable cups, people aren't always disposing of them correctly and 100 billion single use cups are ending up as landfill. It's unnecessary waste that can mostly be avoided with the help of a reusable cup. There are plenty of options available in different sizes, designs, and materials. I have two reusable cups: a KeepCup made from glass and cork and a Ecoffee Cup made from bamboo. I love the look and design of the KeepCup but it leaks! The Ecoffee Cup, on the other hand, is wonderful. Stojo make collapsible cups, which are ideal for travelers and commuters. Be careful to avoid single-use stirrers, sealed sugar packets, milk cartons, unnecessary napkins, and other disposable items handed over at the checkout. How do you brew tea in a zero waste way? I'd love to hear your tips or suggestions.